The Babolat RPM Blast 17 string is one of those strings that make up a generation of tennis players. In previous generations tennis string recommendations, the string set up was that of a full set of Natural Gut, then it was Synthetic Gut. I think it was when Rafael Nadal came onto the tennis circuit that he was using a full set of poly strings that made that set up the most popular. That’s how the RPM string got it’s popularity, I remember watching the French Open in 2010 when John McEnroe was talking about how the Babolat RPM Blast 17 makes the ball spin much more and “heavier”. I’ve been on the fence about this string, it is a great tennis string but I don’t think it’s a game changer (I have a few friends that live by this string). 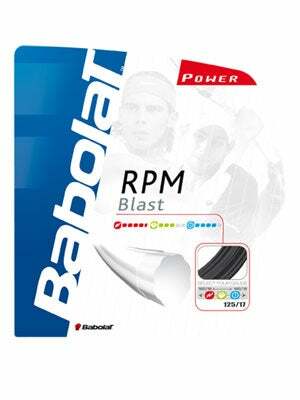 While the Babolat RPM Blast 17 is a softer poly, I’m not entirely convinced that it increases ball revolutions that dramatically (Nadal has a natural tendency to spin the ball a lot more than most players). As far as playability, this is a stellar tennis string, it’s soft on the arm and it performs really well when taking big cuts at the ball. Yes, I did feel like it was “pocketing” the ball when I made perfect contact but it felt unreliable on of center shots. The power behind the RPM Blast was impressive, allowing the ball to fall into the court while maintaining it’s pace. It was also quite durable, it did lose a few pounds of tension within the first hour or so, but it loosened up nicely – like a nicely worn in pair of tennis shoes. However, I did break a couple of sets of the string after about 4 hours of play. In conclusion, does the RPM Blast live up to the hype? That’s entirely up to you; if you can hit the ball like Nadal then it’s perfect for you, but if you’re not like Nadal then I would try it a couple of times, just to make sure you want to commit to it. The RPM Blast is easy to string, it’s got the cool black color, and well it is a great string – but not the best.